Someday, I’m going to be a pioneer. I’ll travel in a covered wagon, settle on an empty prairie, build a log cabin with timber cut from the creek bed. I’ll cut notches in the logs and carefully set notch upon notch, climbing the corners of the cabin to build it higher and higher. It’s been a dream of mine since my earliest days, those days when I first read Little House on the Prairie. But while I’ve been able to accomplish some of the childhood dreams elicited by books, I have not accomplished this particular one-and likely never will. The closest I’ll get will be building Lincoln log houses with children. I was struck, rereading Little House on the Prairie for the first time in several years, with how much of the book is focused on the mechanics of building a home from scratch–but also much I missed of the rest of the book. I never caught, on my early readings, just how tenuous the Ingalls’ resettlement was. Pa heard a rumor that Indian territory would be opening for settlement, so he uprooted his family and moved in. Despite there being plenty of non-Indian land around, Pa settled within an Indian reservation–knowing that it was an Indian reservation. He considered it to be just a matter of time before the Indians would be resettled. That’s what happens when white men move forward, he assumed; the Indians move on to make place for them. And of course the US government would back up the white settlers who were squatting on Indian land. Of course. It’s astonishing to think. How can someone (who isn’t desperate) know that the land they’re living on belongs to someone else but yet still choose to build upon it in hopes that they’ll come out on top in the end? In some ways, Pa seems so advanced in his views of Indians. He didn’t hate them or fear them, he tended towards the “noble savage” viewpoint (which I definitely had as a child, at least in part obtained from the Little House books). Yet his attitude in settlement was almost like many would treat wild animals. Yes, suburban sprawl will impact the native animal population, but people are more important than animals and the animals will move to other places and adapt. It’s challenging, revisiting the prairie through these new eyes. My view of Little House on the Prairie has also changed now that I am married and have moved from being near my family to be with my husband. In the months leading up to our marriage, Daniel and I talked of various directions our life could take-of different educational and professional routes Daniel could take, of different places we might end up living. I blithely told Daniel that I would follow him anywhere. And it’s true. I will follow him anywhere. But, having moved once to follow him, my determination to follow him anywhere has much more fear attached. The move to Wichita has not been easy for me. I battled a depression over this past year that was more severe than any I have battled before. I am now finally, one year out, starting to find my balance. The thought of uprooting again terrifies me. I can’t help but think of Caroline Ingalls as I read Little House on the Prairie. I imagine how hard it must have been for her, leaving her family and “civilization”, spending months without anyone to talk to but her husband and their children, just starting to establish a home when news comes that you must move again. I wonder if she felt more sorrow or more relief when it became clear that they must not stay, that they would need to backtrack, that they would return to Wisconsin. Was she sorrowful because of the year lost, the work done and left for others to enjoy? Or was she elated to be returning back to her family, to the little house they once loved? And what was she thinking when Pa’s wanderlust struck again later (when they left for the banks of Plum Creek)? It’s interesting, revisiting old places and seeing them through older, more mature eyes. 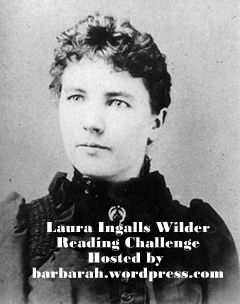 I wondered at the beginning of the Laura Ingalls Wilder Reading Challenge if I wouldn’t try to make something from Little House on the Prairie, like I did with Little House in the Big Woods a couple years ago. I didn’t. The closest I got was creating some log cabin quilt blocks for a quilt for a soon expected nephew and building log cabins with Lincoln logs with the kids of some friends from church. I don’t regret that I didn’t do more–this year’s challenge was thought provoking enough that I didn’t need the extra activities. I read this title as a part of Barbara H’s Laura Ingalls Wilder Reading Challenge and the Reading to Know Classics Book Club. You can check out what other people have been reading at Barbara’s challenge wrap up post and the RTK wrap-up post. I always enjoy reading your thoughts about books that I’ve read, and this one is no exception. Like you, when I read Little House on the Prairie as an adult, I discovered so much deep, heavy stuff in it that I never had the foggiest idea about when I was a child. For me, what stands out the most about that book is that three times, all of their family could have been killed, and there was essentially NO help for them: the prairie fire, the sickness, and the Indians. I know they were helped by neighbors and that kind doctor when they were sick, but that didn’t happen right away, and they very possibly could have all died. How in the world would I have felt to take my family somewhere so isolated and then be threatened by death three times, and feel so completely powerless to stop it? No wonder Pa drove himself so hard to stay awake and alert when the Indians were discussing war. What an interesting perspective, considering you have left your family and moved to follow Daniel. I left my family but I did that before ever meeting Jonathan so my experience is not at all the same. (Plus, neither of us can imagine moving from where we are now.) You HAVE had a most interesting journey though this past year and it does indeed sound like this read gave you a lot to think through. I can’t imagine being Ma, picking up and moving all over creation and starting over from scratch time and time again. She’s a curious and brave woman, I think. I’ve read conflicting reports about just how much Pa knew about exactly where they were settling – it’s hard to know what to believe. It’s hard to think of him being calloused about it.